Hi, everyone. Sorry I’ve been a little AWOL since Thanksgiving. I’ve enjoyed spending time with family and taking a few vacation days from blogging. 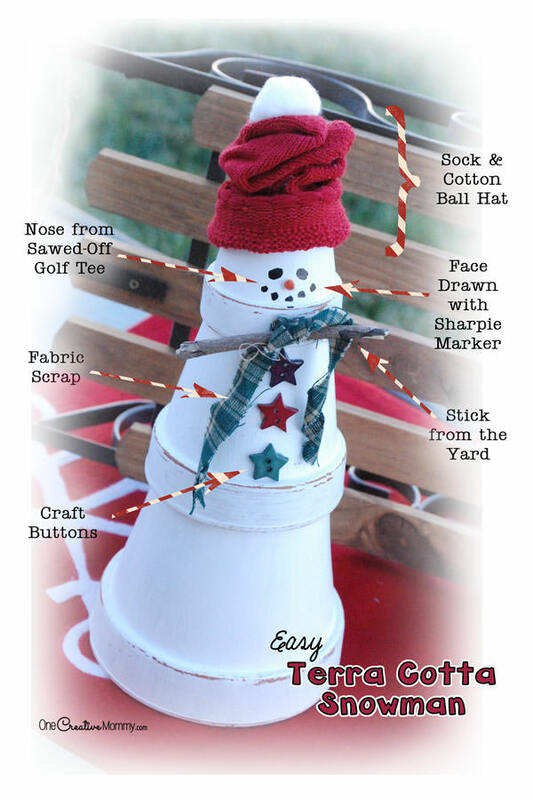 Now I’m back with a great kids’ Christmas craft idea. 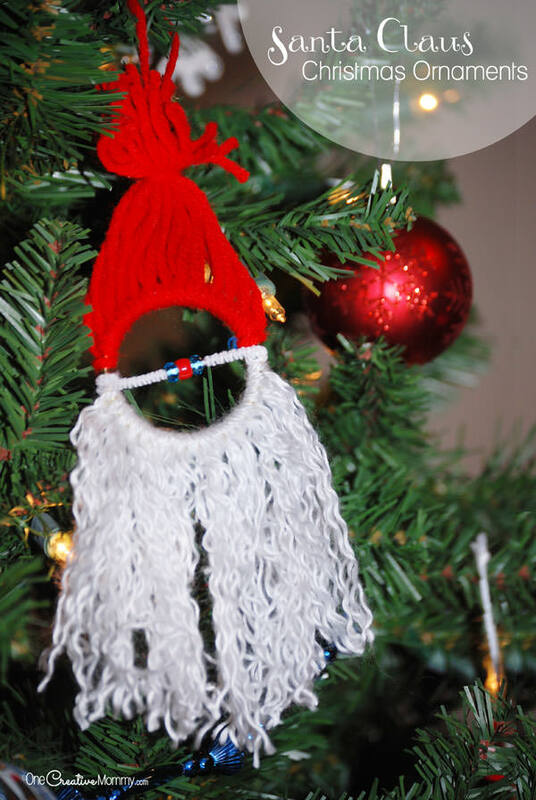 These homemade Christmas ornaments for kids are simple and adorable. 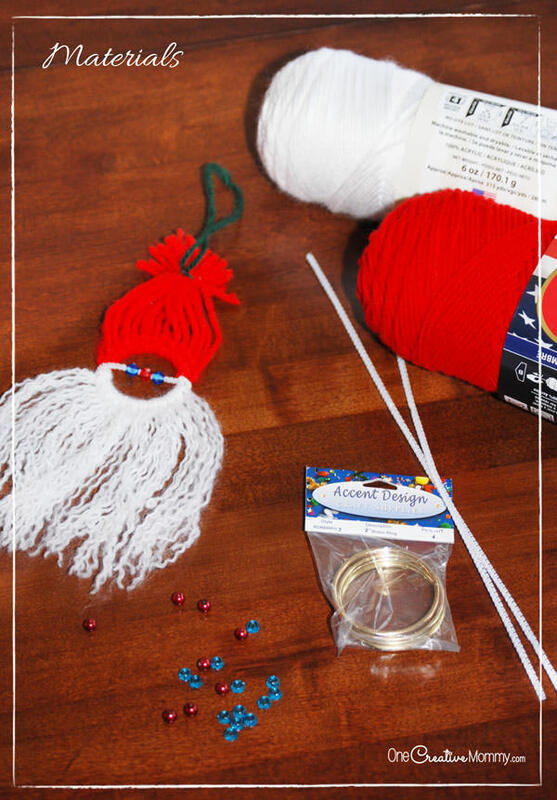 It only takes a few supplies to create yarn Santa Claus ornaments. That’s it! The hardest product to find will be the macrame rings. I couldn’t find them small enough at JoAnn’s, but I found these at Ace Hardware (which also has a craft section). I had much better success once I learned what they were called. Sound complicated? Don’t worry. It’s not. My nieces (5) only had to be shown once, and they got it. 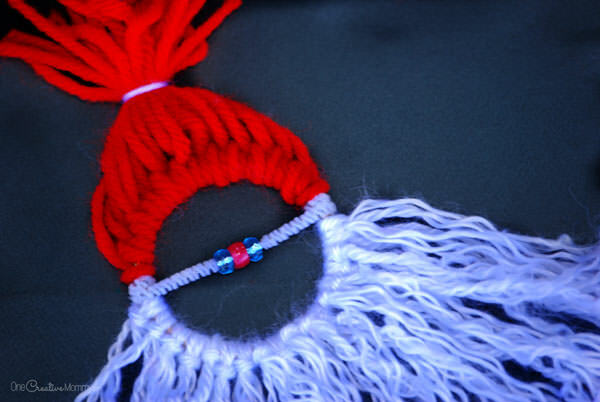 Continue looping strands of yarn until one half of the loop is covered in red and the other half is covered in white. 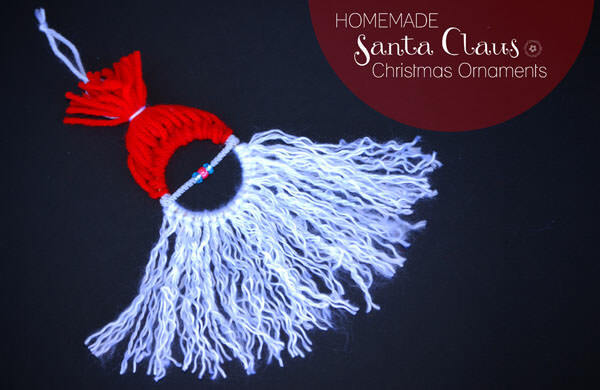 (We used two or three more white strands than red.) Leave a small space for the pipe cleaner to fit. 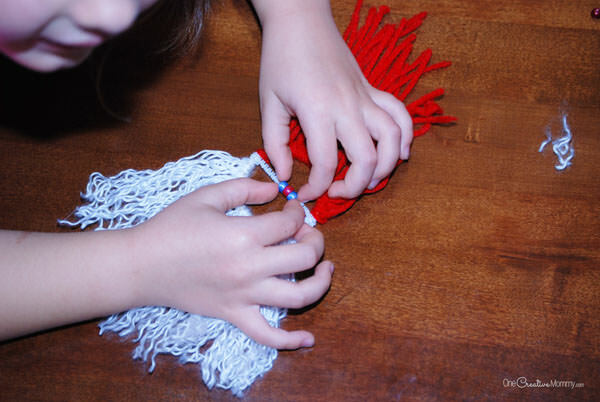 Thread a blue, red, and blue bead onto the pipe cleaner. 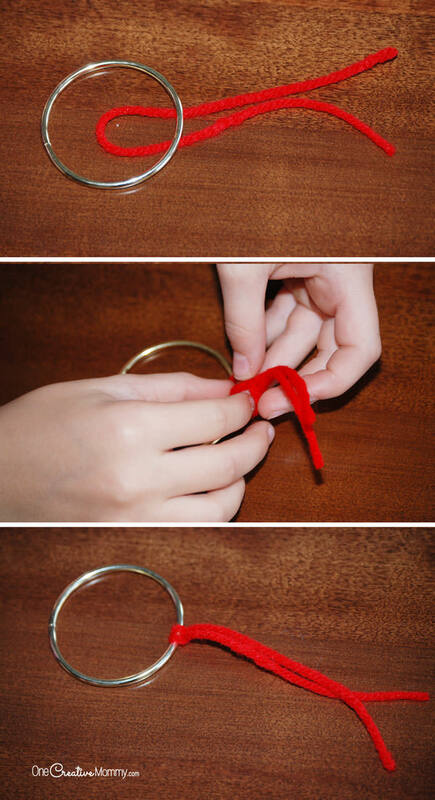 Attach it across the middle of the ring (between the red and white yarn) by rolling the ends around the ring. 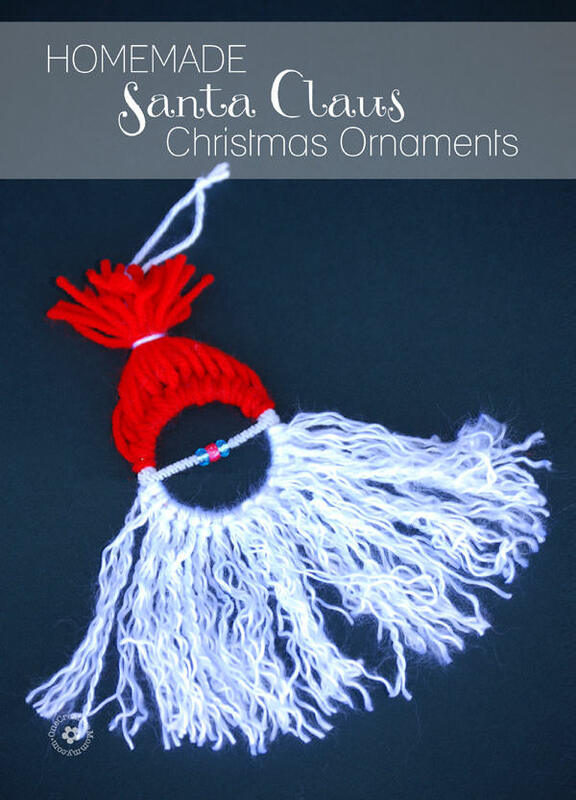 Unravel the white yarn by twisting it gently in your fingers until the threads separate. (Twist it in the opposite direction that the strands are wound together.) Once the threads have separated, carefully pull apart the individual strands. Some kids may need more help with this part than others. One twin wanted help, and the other did it by herself (slowly). Trim the red yarn if necessary. 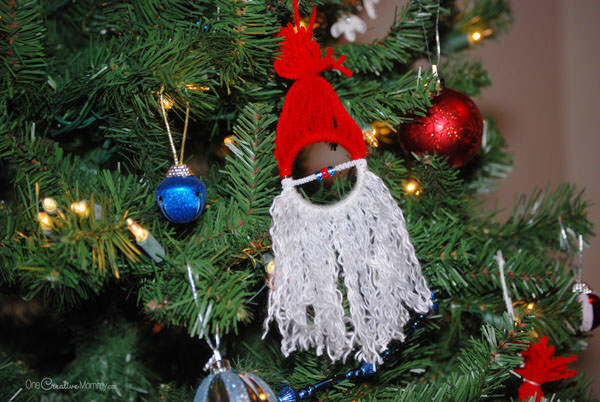 Give Santa’s beard a trim (if desired) by carefully rounding the outside edges. (I just had to add this picture, because I love the tiny hands trying to get Santa’s eyes just right. You’re all done. Now, just hang it on the tree or give it away as a gift. 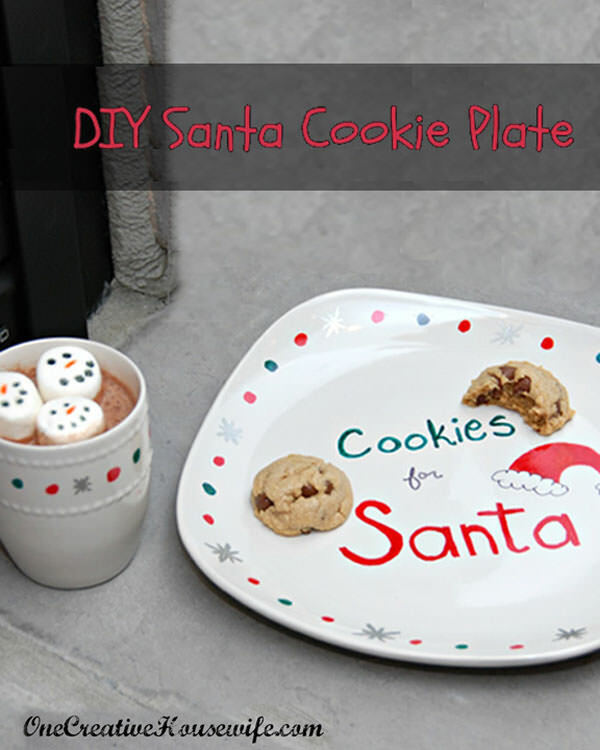 This “Santa” is so adorable! Thanks so much, Marilyn. 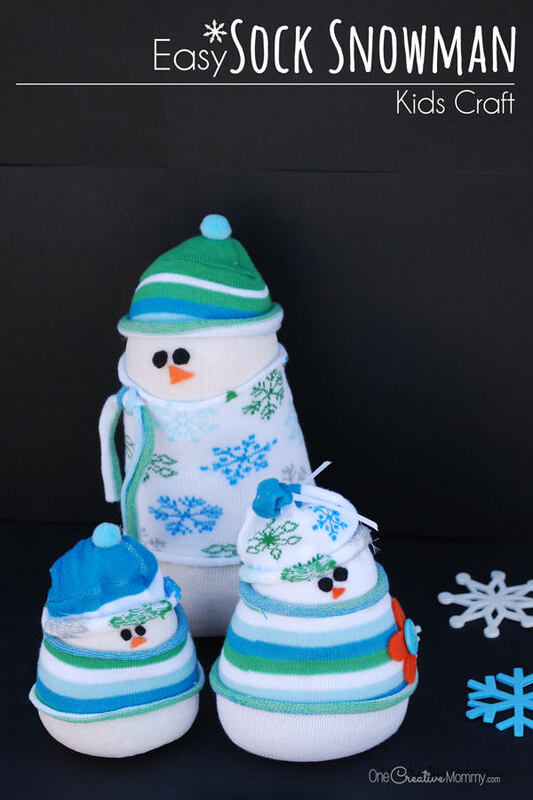 We had a lot of fun making them. Super cute Santa Claus. I love that it works with fine motor skills. Thanks, Victoria. The youngest kids I tried it with were 5, and it worked great. That is perfect, because my son is 5 and we have been on an ornament making marathon these past couple days. He is loving it and our tree is getting more and more decorated. I love decorating with the ornaments my kids make. I’m afraid you won’t find a fancy hands-off tree at my house! Christmas is for kids, so why not let them decorate, right? I bet your tree is amazing full of your son’s projects.